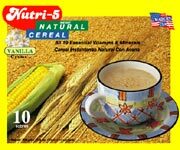 Nutri-5 instant nutritious cereal is made from selected nourishing grains, fortified with 19 essential vitamins and minerals. Nutri-5 will provide a substantial and satisfying meal beverage that is easy to prepare at any time in your busy life style. Empty the contents of one sachet into a cup. Add 6oz (177ml) of hot water, stir well and enjoy the nutritious delicious taste. Yellow Corn, Whole Wheat, Baby Oats, Oat Bran, Barley, Brown Rice, Malted Barley Extract, Non Fat Milk, Corn Syrup Solids, Partially Hydrogenated Soybean and/or Canola Oil, Sodium Caseinate (A Milk Deriative), Dipotassium Phosphate, Soy Protein Isolate, Carrageenen, Soy Lecithin, Sugar, Multi-vatamins, Natural and Artificial Flavour (Vanilla). Calcium Phosphate, Magnesium Hydroxide, Sodium Ascorbate (Vitamin C), Reduced Iron, Vitamin E Acetate, Niacinamide, Copper Gluconate, Zine Oxide, Calcium Panto-Thenate (Pantothenic Acid), Vitamin A Palmitate, Pyridoxine Hydrochloride (Vitamin B6), Thiamin, Mononitrate, Folic Acid, Biotin, Vitamin B12.